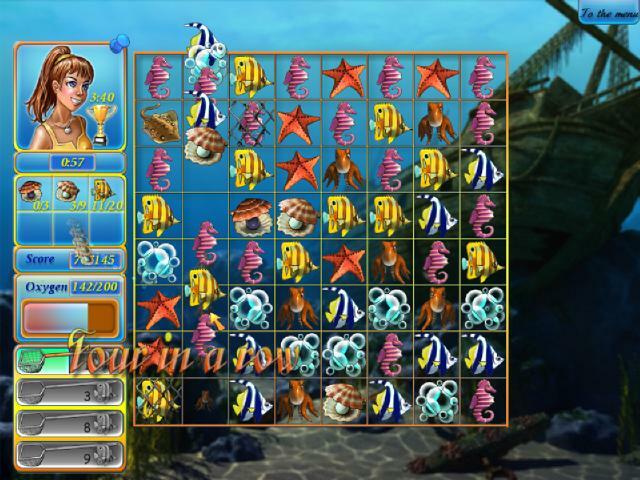 Tropical Fish Shop Downloader - Help Annabel saving the tropical fish store. Annabel lived for scuba diving. This is the story of what happened when she turned her passion into a career by responding to a job advertisement at a tropical fish store. The store had fallen on hard times, and Annabel offered to provide sea creatures that she caught on her dives. The store had empty aquariums, but very little beyond that to draw in any customers. The store owner, who was about to close the shop and change businesses, decided that he had nothing to lose, and gave Annabel her chance. Day by day, the gloomy, empty store was transformed into a bright, bustling shop. The aquariums were once more full of beautiful fish, and the store shelves were overflowing with supplies. As business improved, Annabel's enthusiasm infected the owner, too. Everything was going well until a real estate developer bought the property out from underneath the store. They had just two weeks to buy back the property, or move out and make way for a new hotel! They decide to try to keep the store, and pursue business with renewed determination. But after only a few days, it looks grim. Annabel can't help but notice the owner is packing up. Shortly thereafter, our heroine is at home, examining her recent finds. Among them, she discovers a small document chest that reveals location of a sunken ship. She figures out where the map leads to, and makes several dives, eventually finding the ship, and its treasure! With their new-found riches, Annabel and the owner close shop to reopen in a bigger, better location. And everything ends..well. swimmingly! This game is free to download and install so ENJOY.